Mail came to Media by train 120 years ago. 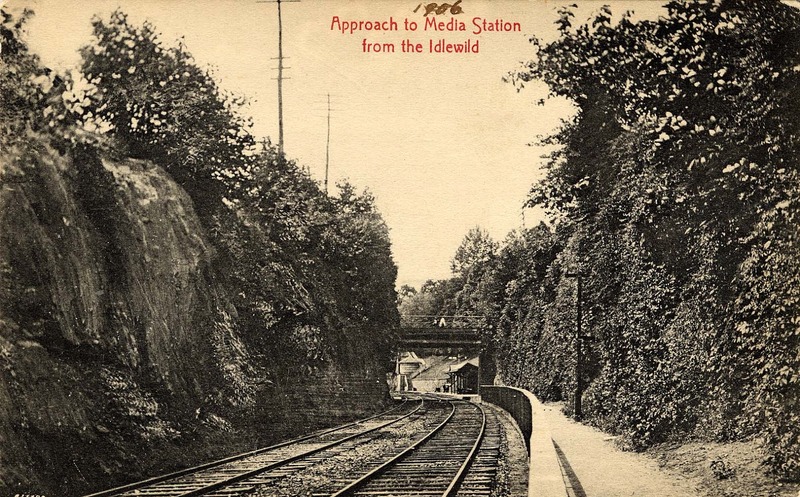 The above picture is the approach to the Media Train Station. Note: When free mail delivery began to happen in the early 1890's, many towns did not like it. The Federal Government did it town by town, by population and need. Mail came by train to many towns 120 years ago and people would walk to their post office 3 or 4 times a day to get mail. Mail delivery meant only once a day for mail. Another objection was cost, getting your own mail by walking to the post office meant all that was needed was a clerk, no carriers etc. People were worried stamp cost could go to 2 maybe 3 cents to pay for the luxury of home delivery! Imagine that!! Media is to have a free delivery mail service after December 6th next, provided the regulations of the post office department, which requires the posting of the names of the streets at the intersections thereof, and the numbering of the houses, be complied with by November. Acting Postmaster, Edgar T. Miller received notice to this effect from Postmaster General Wanamaker yesterday. An allowance of $1200 a year has been provided for the carrier service, and there will be but two routes and two carriers to start with. There are many applicants, some of whom had petitions in circulation when the subject of free delivery was first broached over a year ago. Media is one of the very few towns in the United States of 8000 population doing a postal business sufficient to entitle it to a free delivery. The salary of the postmaster, which is regulated by the business done, is equal to that of many cities of 20,000 population. The salary has been raised twice within the past two years, and quite recently Postmaster Miller was granted an additional allowance of $400 for clerk hire, making $1600 for this purpose alone.